Getting on the highway at five o’clock? Pack a snack! Traffic jams. Nobody likes them! Cars on the freeway, herds of cattle, even swarms of robots have to deal with traffic jams. What’s the secret to avoiding this misery? Meet Daniel Goldman at Georgia Tech. He identified one animal well-adapted to traffic: fire ants. 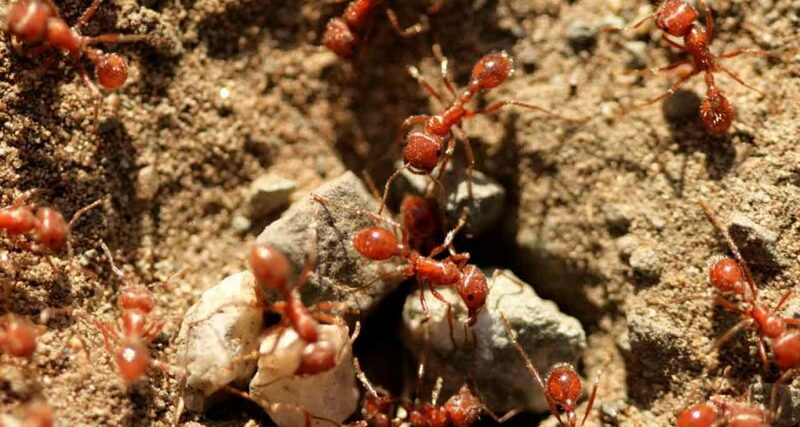 His team observed tunneling ants with cameras and noticed a peculiar pattern. About one in four ants did nothing. They would enter a tunnel, reverse, and leave without digging at all. Working hard or hardly working? Computer simulations revealed that an equal distribution of workload actually led to LOWER overall productivity. Can we apply this to other traffic jams? To find out, the team built tunneling robots. When four robots dug together with equal gusto, they ran into each other. They got stuck – instant sig-alert! When four robots dug together, some not really trying, they tunneled more quickly. Traffic flowed smoothly. The ants’ strategy works! Tell this to your boss the next time she catches you goofing off. We IDLE ants make the work flow faster!